How to keep your child from interrupting you: 5 easy solutions. Welcome to another installment of WTF Wednesday, where our answers are free of artificial additives like logic and reasoning. As you may know by now, the questions we tackle with such expertise come from our readers, Twitter followers, Facebook friends and Internet search engine truth-seekers. Today’s question comes via Twitter but, alas, not from a follower of @IBecameMyDad. In fact, I suspect she doesn’t even know IBMP exists. How, I’m sure you’re asking, could someone NOT know about I’ve Become My Parents? Well, in most cases, I’m pretty sure it’s because they actually have lives. It would seem they use these lives for things like work and family and other questionable activities. Today’s question was posed on Twitter by the folks over at Today’s Parent magazine, on behalf of their Editor-in-Chief, Karine Ewart (@Karine_Ewart). Granted, it wasn’t directed to our crack(ed) parenting experts here at Advice Central, but we’re here to help. If but one parent lies awake at 2:00 AM with unanswered questions, my work is not done. Plus, it sounded like one I could have fun with. Do you have any tips for keeping children from interrupting you? If the length of time it’s taken me to write this post is any indication, the answer would certainly have to be, “No, not any that actually work.” But the good news for you is that experts rarely actually follow our own advice; it’s kind of an unspoken agreement among us experts. In fact, most politicians subscribe to the same “under no circumstances should one practice what they preach” philosophy. It’s just the professional thing to do. There are two categories of interruptions we need to consider: interrupting you while talking, and interrupting you while working. Interrupting you while talking is definitely the worst. When your kids interrupt your work you could lose your job, your reputation and the income you need to survive. Interrupting you while talking has the much worse impact of making you look bad in front of other judgmental parents. Let’s consider both. This is what you’re trying to avoid: you’re in the middle of a really important conversation about whether Carlos or Mike looks better with their shirt off on Desperate Housewives, and your kid starts doing that little tug on your pants “mommy, mommy, mommy, mommy” thing. Your friend/competitive parenting rival starts giving you that look that says, “Well, are you going to discipline your rude little beast or cave and give her the attention she’s so inappropriately looking for?” What can you do? Your first goal should be to avoid the possibility of physical contact. This is best achieved by always wearing a pair of insulated, electrified pants. At the appropriate voltage, your child should fly back no more than 5 feet and regain consciousness within less than a minute. The incessant pants-tugging should quickly become, well, um, cessant. These pants are, of course, useful in several other circumstances. But don’t expect your husband to learn quite as quickly as your 5 year-old; it may take several attempts before you see success with him. Also, hang on to the pants because you’ll certainly want them for your daughter when she’s of dating age. If you find yourself in the unfortunate position of being caught without your electric pants on, you’ll need to start playing a more offensive game. For this, I recommend the Jujube Technique. We’ve discussed this technique before in the context of keeping kids quiet at the theatre. It works on the notion that the human jaw is incapable of breaking the bond formed when a Jujube cements the upper and lower teeth together. But it requires a bit of planning. Before entering into a conversation, hand Junior a wad of Jujubes. Allow 30 seconds for the bond to set, and begin your conversation. Other parents will think your darling child is remarkably quiet and will often mistake the failed attempts at pulling the upper and lower teeth apart for an ear-to-ear smile. Well-trained guard dogs work in some households. In ours, they’d be wearing dresses and pulling my son’s wagon within about two minutes. If you’re fortunate enough to own your own home, some minor renovations can make a world of difference. 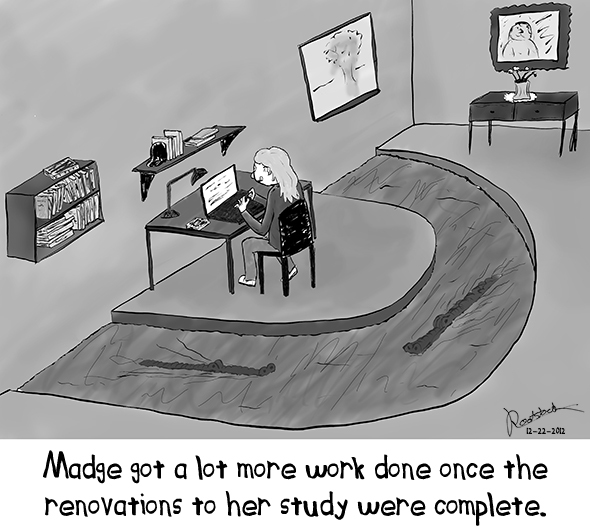 Probably the most effective DIY renovation is the installation of a moat surrounding your desk. About 2 meters wide and 3 meters deep is generally sufficient. The width and depth are important because alligators require a fair bit of space to move about. Unfortunately, my wife is allergic to alligators (well, actually, she’s allergic to alligator bites as it turns out), so we were forced to find another solution. The solution for those with alligator allergies or renters who wish to get their security deposit back is about as low tech as it gets: surround your work space with an impenetrable ring of broccoli. Very few things make a stronger force field than broccoli. ← Another fresh batch of favorite tweets! Thanks…you scared me for a second, BTW 🙂 I like the children’s chew toy idea! Hope you’ve patented it already. Whahahahahaha! Oh, you are hilarious! Great tips by the way! Wish I’d known of them sooner but it’s not too late to start I suppose! LOL! Never too late, Sonel. Works on spouses, too. I bet it’d work with roommates. Let me know if you give it a shot, but if someone you know gets eaten, you were never here, OK? You bet. Thanks for letting me know you were here and liked it! I would install a moat with alligators, but I think my kids might scare them. Hahahaha! Yes, that would be so unfair to the alligators, wouldn’t it? Try the broccoli; I’ve heard that stuff’s pretty fearless. Tell your husband I’m sorry, by the way. Just don’t tell him I’m lying about being sorry. I need a moat like that! I’m thinking of making a business out of it. You don’t know where I can get a case of alligators by any chance, do you? So it turns out that if you live, say, on the 15th floor, the whole moat thing has some logistical issues. Seems that alligators are agoraphobic. There was something else, too, but it’s probably not a big deal. Great picture and wonderfully funny advice! I don’t mind at all. 2Say works, too. Or you can make up a nickname – like the Idiot Speaketh did. He just calls me Heather. Perfect advice! You should patent those electric pants – and the ring of broccoli is a go! You had me until the broccoli line. My son loved broccoli. But those pants could sure come in handy.